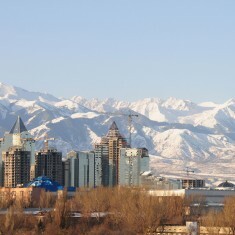 Almaty Region | Almaty Region | Ecosign Mountain Resort Planners Ltd. 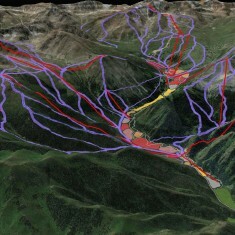 In July of 2012, Ecosign was chosen to lead a team of professionals retained by the Government of Kazakhstan to prepare a Feasibility Study and System Development Plan for potential ski resorts near Almaty (pop. 1.5 million). 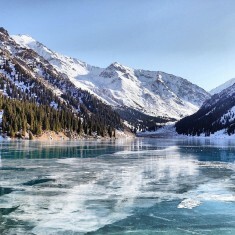 The study area covers 2,200 square kilometers and encompasses a good portion of the Lle Alatau National Park in the Tian Shen mountain range south of the city of Almaty. Phase 1 of this study was to prepare a Technical Assessment of the natural terrain of the study area as it related to resort development and to identify potential mountain resort zones. After careful consideration of the area’s physiographic and climatic conditions including exposure, elevations, slope analysis, base area slope analysis, snow cover, solar, incoming solar radiation and geophysical, nine areas of interest were identified: Ak Bulak, Tabagan, Butakovka, Turgen North, Shymbulak, Kok Zhailau, Big Almaty Lake, Kaskelen North and Kaskelen South. The next phase was to prepare resort concept plans for the nine sites. This included both the mountain and the base lands. We then ranked each site for its capacity and strengths. The top ranking site (Kaskelen South) would have the potential of 31,600 skiers per day at buildout and could accommodate a pedestrian oriented resort village with 28,500 beds. The study was reviewed and accepted by the Kazakhstan federal government in June 2013.